From the heartfelt to the playful, A Mighty Girl's favorite gifts for celebrating Mighty Moms! For many Mighty Girls, their mother is the model for everything they want to be — and a special mom deserves a special gift for Mother’s Day! If you’re looking for some great ways to celebrate and inspire a Mighty Mom in your life, we’ve put together a selection of gift ideas that will help you let her know how important she is. These gifts will help her connect more closely with her Mighty Girl; let her record her thoughts, experiences, and wisdom to share in the future; help her show her own mightiness in fun and playful ways; and inspire her for the year ahead. 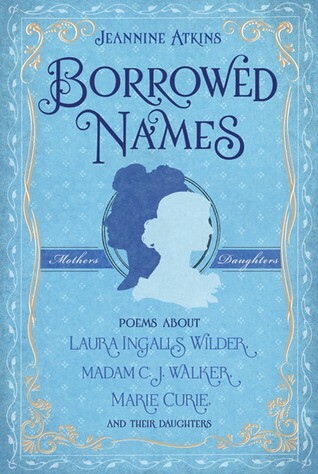 For more ideas for celebrating a special Mom this mother’s day — including many recommendations of books for children and teens about the unique mother / daughter relationship — check out our blog posts 30 Books Celebrating Mighty Moms and Their Daughters and Inspiration for Mighty Moms: 50 Books for Mother's Day. Whether she’s recording details of her life before she was a mom, sharing some of her hard-earned wisdom, or opening a written dialogue with a daughter of her own, these journals will give her new ways to reflect and write about her life. A journal is a great way for a Mighty Girl to let Mom know just how much she loves her! This palm-sized book contains 50 prompts about many elements of her relationship — from "I couldn't live without your..." to "You inspire me to..." Make your entries as heartfelt, funny, or silly as you'd like! Because the blanks are small, even preschoolers can come up with ideas to fill every page, but older children (or even adults) can still express all of the special things that Mom means to them. 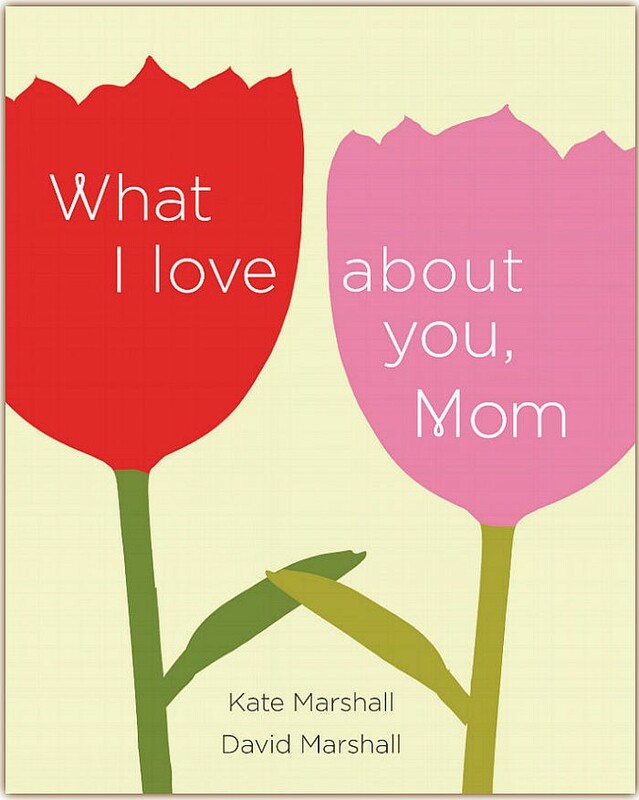 With this personalized book, you can let your mother know just how important she is to you! The 80 pages of writing prompts and space for photos and drawings provide plenty of opportunities for you to share the special things you value most about your relationship with your mom. Prompts like "One of my earliest memories of you is..." and "I'm thankful you brought me up to try to be..." help you explore and celebrate your unique relationship, resulting in a one-of-a-kind keepsake she'll treasure. 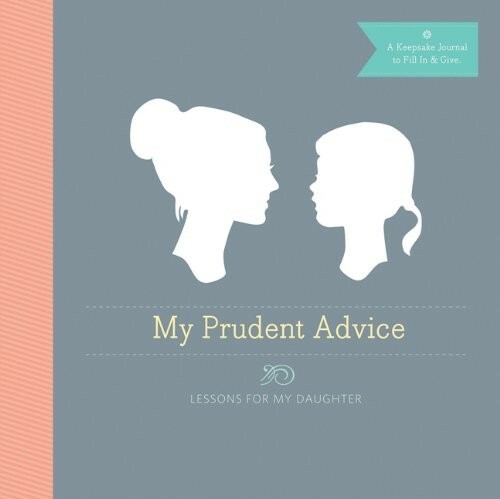 The advice Mom has to pass on to her daughter is hard-won and comes with long experience. Sometimes, though, it probably seems to her like she has too many things to tell her daughter. How does she know which are most important? In this journal, prompts on topics ranging from family to love to travel to finding your passion will help her write down the things she most wants her daughter to know. At the end of each section is an open page to jot any additional ideas or musings she has on the topic. With an elegant design and inspirational quotes throughout, this keepsake journal is sure to become a favorite. 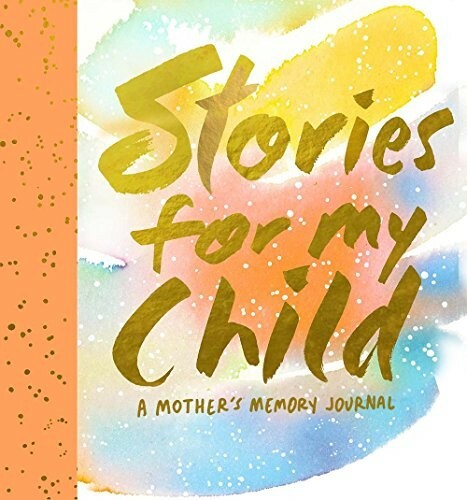 In this gorgeous journal, moms can keep a special record of their time with children, from first days at home to sending a newly independent child off to school to watching them grow into a young adult full of promise. Beautiful illustrations make it visually appealing, while carefully chosen prompts answer the ever-popular question "What was I like when I was little?" As a final touch, a built-in envelope can hold a letter from mother to child, perfect for closing the childhood chapter when the "little girl" is ready to fly on her own. A daily journal entry can feel like a big mountain to climb if the mom you know is as busy as most moms are! But every day has a special moment she’s likely going to want to remember, and this memory book is the perfect way to do that. Each day’s entry offers enough space to write about one great quote, special event, or memory to cherish for the future. Because of the layout of the book, you can start writing on any day of the year, and look back when it’s done to see five years’ worth of a given day’s entries all at once. It’s a great way to get a mom started on journaling some of her thoughts and favorite experiences. 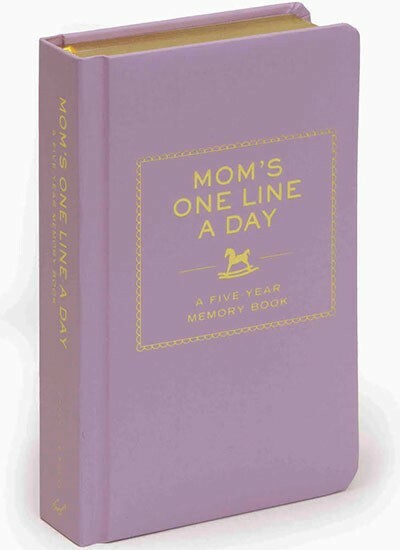 For a similar memory book suitable for anyone, check out One Line A Day: A Five-Year Memory Book. With this journal, Mom can capture the changing landscape of her family over five years! This daily journal, which is designed so you can start it on any date, has one question per day of the year to get Mom writing — everything from "What's something you've done for your child that you never imagined you'd do?" to "What were you thinking about as you fell asleep last night?" As the journal fills, Mom can see how her answers evolve over five years, resulting in a truly unique keepsake that celebrates her own family's journey. This textured hardcover journal is both a precious keepsake and mother-child experience all in one! 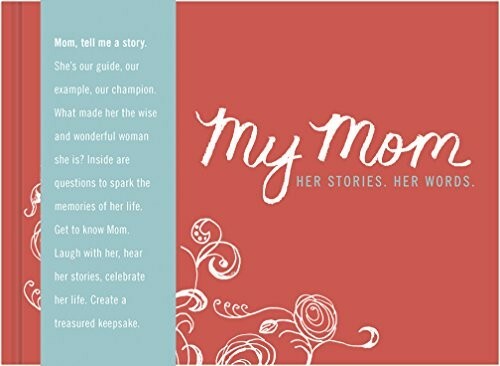 Each page includes questions to spark Mom's memories and inspire her to share her story with her children. From "what was your favorite holiday growing up and how did your family celebrate it" to "who were your best friends? ", these thought-provoking prompts turn this journal into a unique project that encourages special time together. When you're finished filling it out, it's ready to keep as a reminder of both your amazing mom's story and of the shared moments you both treasure. This shared journal has been a favorite of the Mighty Girl community since we first added it to the site. 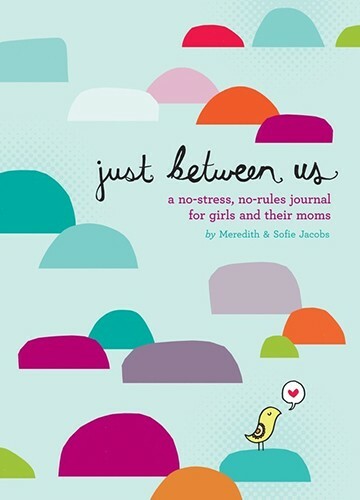 Written by mom and daughter Meredith and Sofie Jacobs, this fun volume was designed to make it easier for mothers and their daughters to connect and learn more about each other — in writing, which can make it easier as the relationship goes through the challenging tween years. 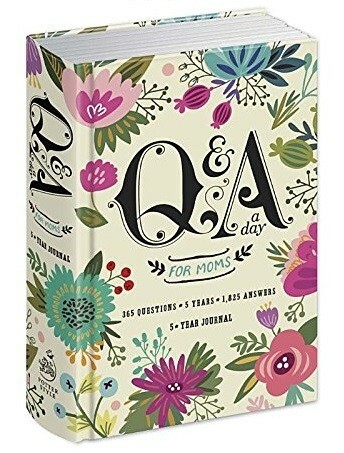 By passing this journal, which is full of writing prompts, sketch pages, and other fun ways to connect, back and forth, both mom and daughter can discover all sorts of things about one another and themselves. For a wonderful gift for grandmothers, there is also a new Just Between Us: Grandmother and Granddaughter - A No-Stress, No-Rules Journal. Well-crafted writing can do so much to capture the beauty and significance of a mother’s role. These poems and essays celebrate all the ups and downs, worries and triumphs of parenting. It’s a great way to give that special mom you know something to lift her up and encourage her to be the wonderful person she is. 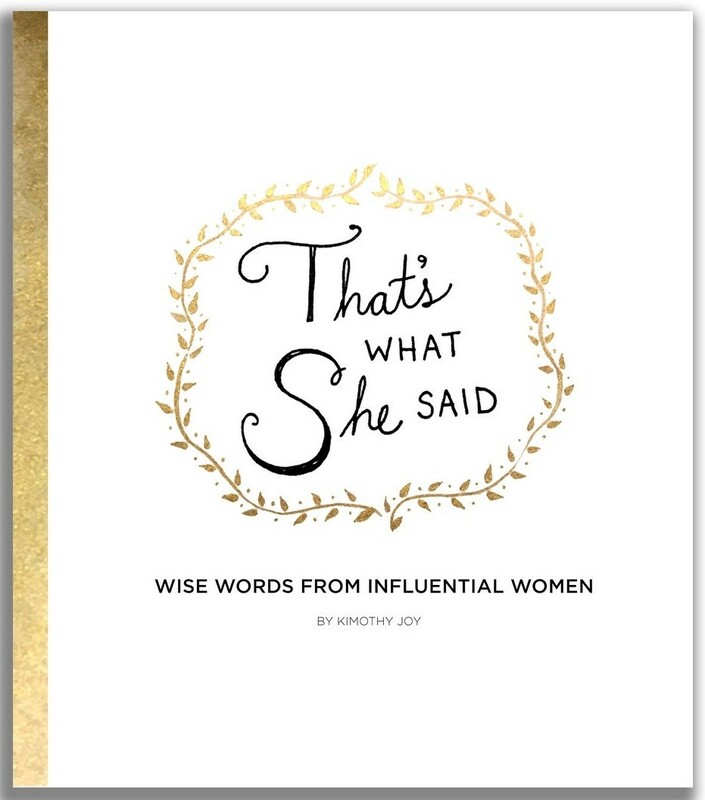 Artist Kimothy Joy has created a gorgeous ode to strong women in this stunning book featuring hand-lettered quotes by 50 influential women from around the world including Emily Dickinson, Grace Hopper, and Michelle Obama! Each meticulously crafted quote is paired with a portrait of the woman who said it and an enlightening capsule biography that captures how that woman changed the world. Beautiful and informative, it's the perfect choice to inspire and uplift any woman. 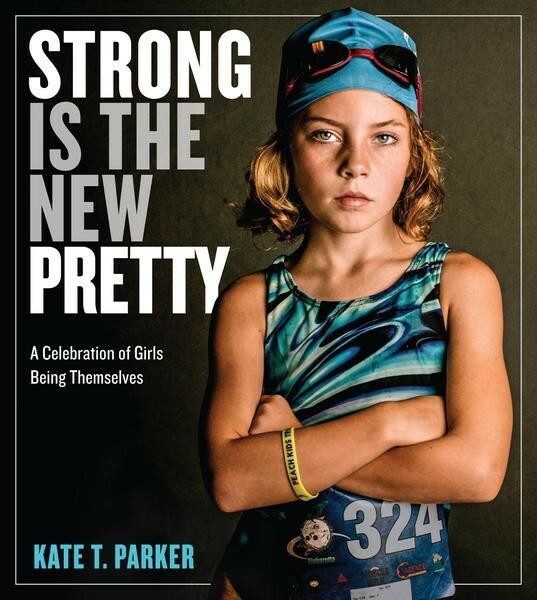 When photographer Kate T. Parker snapped a photo of her daughter right before her first triathlon, she started a new project that would celebrate the diverse, authentic, wonderful girls all around the world! In this book, Parker collects 175 photographs that defy the restrictive notion of beauty that's often presented in the media. Instead, she captures girls being fearless, kind, wild, proud, silly, and so much more. Each full-page picture is accompanied with a short quote from the featured girl reflecting on her own strengths. This beautiful celebration of the power of girls is an inspiring book that moms can share together with their daughters. 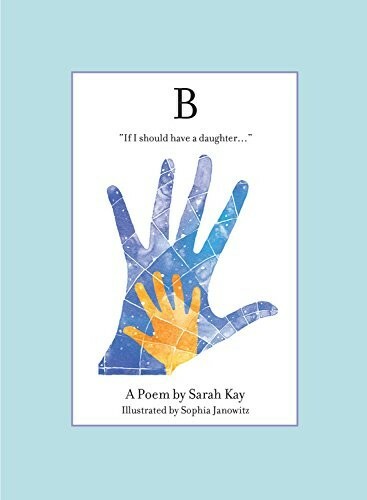 "If I should have a daughter, instead of Mom, she's going to call me Point B...." Sarah Kay's stunning poem B was the highlight of her 2011 TED Talk in Long Beach, California. Now, the text has been accented with elegant illustrations for this hardcover gift edition. This beautiful celebration of the bond between a mother and her daughter is sure to inspire her this Mother's Day. Fans of Kay will also want to check out the newly released hardcover illustrated gift edition of her poem The Type. Photographer Mihaela Noroc wants the world to reconsider how they define beauty. Over the course of her travels, she developed an online following for what she called an Atlas of Beauty: portraits of women within their communities that celebrate not traditional beauty, but the beauty that is within all of us. 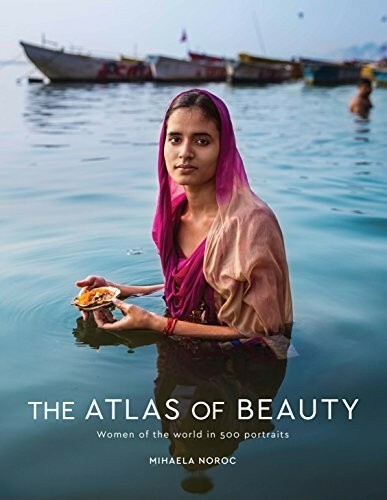 In the forests of the Amazon, streets of London, markets of India, and parks of Harlem, these colorful portraits provide a unique, intimate look at women around the world; now, this hardcover photo book encourages people to flip through her photographs and see the artistry of their everyday lives. "I gave birth to one child, a son, but I have thousands of daughters," beloved author Maya Angelou writes. "You are Black and White, Jewish and Muslim, Asian and Spanish-speaking, Native American and Aleut. You are fat and thin and pretty and plain, gay and straight, educated and unlettered, and I am speaking to you all. Here is my offering to you." In this beautiful book of short essays, Angelou provides snippets of wisdom that she has learned from her own life. 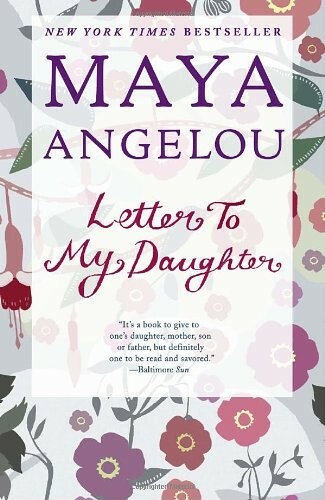 By sharing stories of her life and the friends and family who influenced it, Angelou teaches lessons about compassion, strength, and resilience that will inspire any woman. 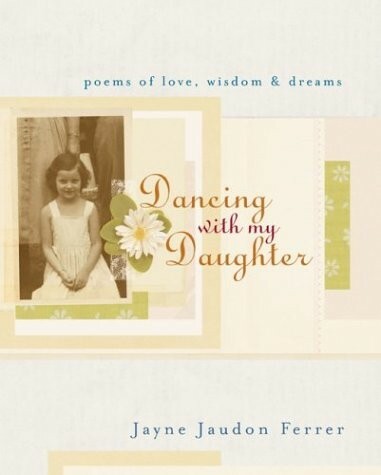 Both moms and teen daughters will enjoy reading this collection of poems telling the story of these three extraordinary women and their equally extraordinary daughters. Atkins captures a nuanced, emotionally powerful picture of these mothers and daughters — both the close bond and the tensions between each pair — as well as the marks they left on history. From the Civil War to the modern day, American moms have changed the course of their country's history — and the lives of their families. 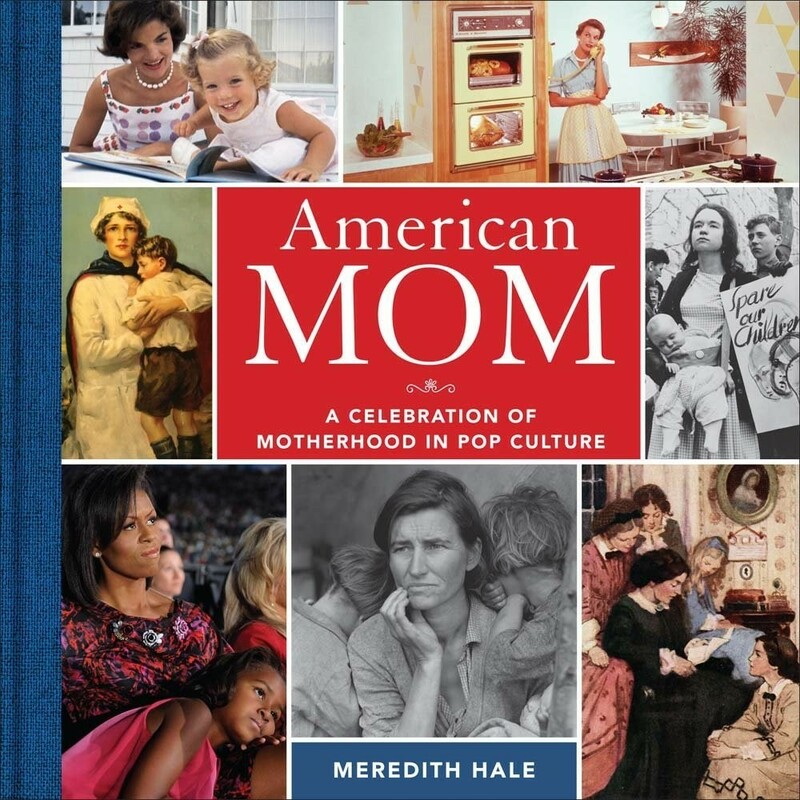 This beautiful illustrated book explores how pop culture has portrayed American motherhood, from the courage of wartime moms, to the iconic '50s TV moms, and to today's social media-savvy moms. The book also tells the stories of innovative moms who have broken new ground, created art, and much more. It's a tribute to the spirit of moms — and the American woman — that's sure to inspire her all year long. 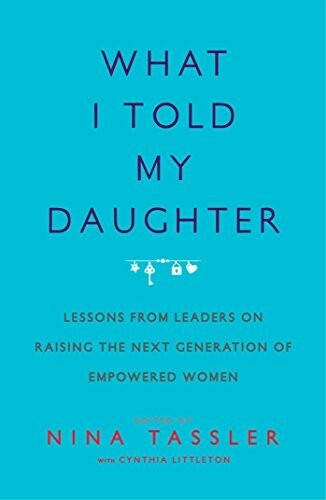 What I Told My Daughter brings together a powerful, diverse group of women — from Madeleine Albright to Ruth Bader Ginsburg, from Dr. Susan Love to Whoopi Goldberg — to reflect on the best advice and counsel they have given their daughters either by example, throughout their lives, or in character-building, teachable moments between parent and child. From one of the country's only female police chiefs who teaches her daughter the meaning of courage, how to respond to danger but more importantly how not to let fear stop her from experiencing all that life has to offer to a bestselling writer who believes that we must teach girls that "resiliency is more important than perfection," this is the perfect collection of essays to share with anyone with a special young girl in their life. Mighty Moms should get to wear empowering clothing, just like their Mighty Girls do! These t-shirts, socks, and other accessories are a great way to let moms show off their courage, intelligence, and sense of fun! 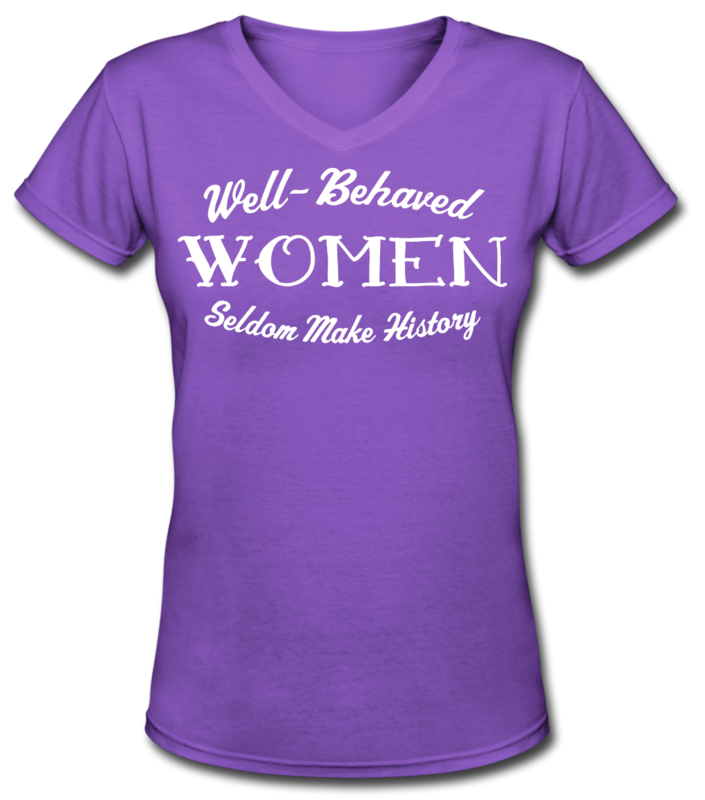 Harvard professor and Pulitzer Prize winner Laurel Thatcher Ulrich famously said, "Well-behaved women seldom make history" — and most Mighty Moms know exactly what she means! This shirt celebrates all of the women — past and present — who challenge the status quo to make the world a better place. Available in multiple colors in juniors, women's, plus, and maternity, there's a shirt with this design to suit every mom. You can even get a matching shirt for her Mighty Girl; the same design is available for infants, toddlers, kids, and youth. Who wouldn't want to be Wonder Woman? 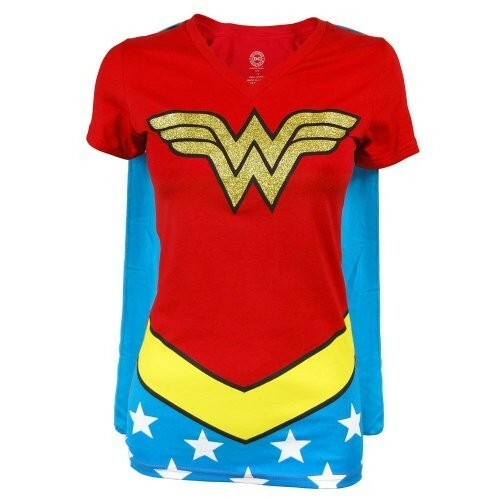 With this glitter-accent shirt — which features a removable cape — Mom will feel like a real superhero! This 100% cotton T-shirt is available in juniors sizes small to extra-large and is perfect for a costume or for day to day wear. You can also get her this fun pair of Wonder Woman caped knee socks or, for a more subtle tribute to her favorite superhero, this Wonder Woman slipper socks. If Mom loves this classic novel, with its engaging and intelligent Elizabeth Bennett, she's not alone! More than 200 years after it was first published, Pride and Prejudice remains one of the most beloved books in the English language and has never been out of print. 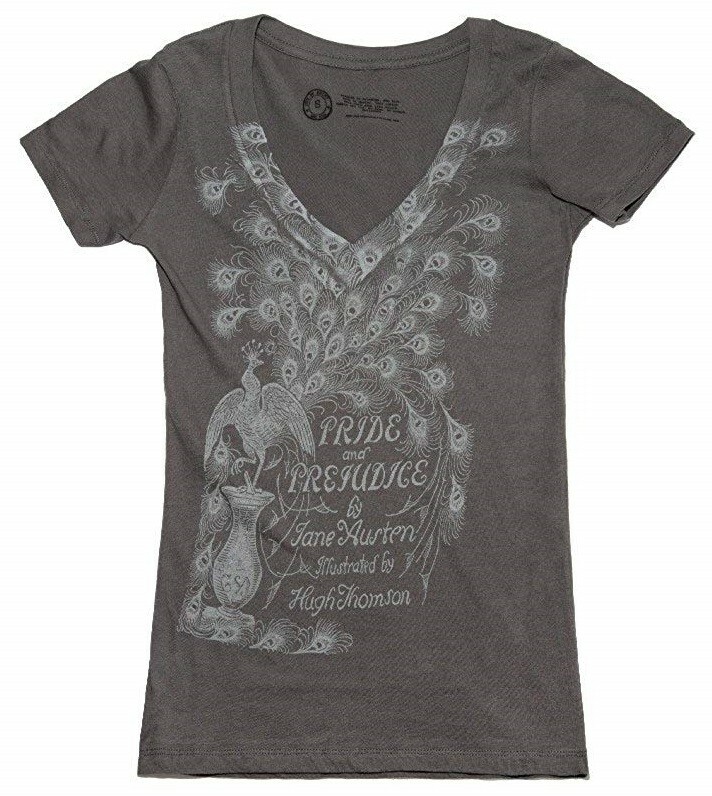 This t-shirt from Out of Print features the first edition artwork for the novel with a softened print that gives a vintage look; it's available in women's sizes small to extra-large. The same print is also available on a fleece pullover or on a blue t-shirt. As with all of Out of Print's products, one book is donated to Books for Africa for every shirt purchased. Numerically inclined moms will love this Pi shirt that celebrates the beauty of math! 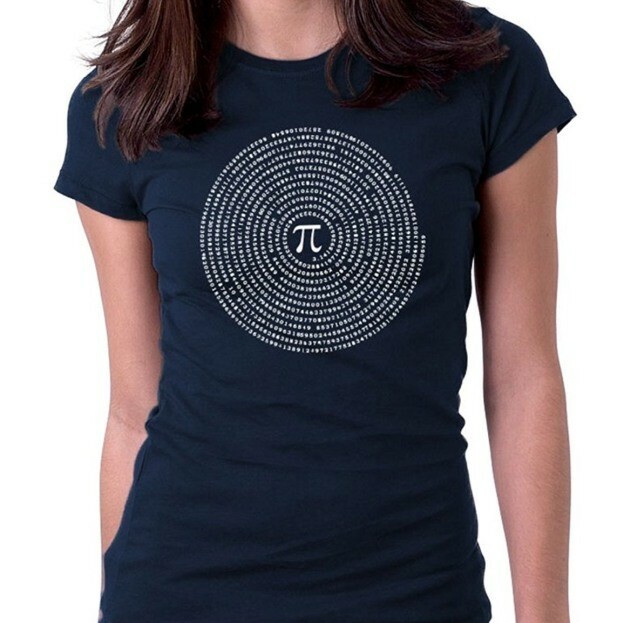 One hundred digits of pi form an elegant circle around its mathematical symbol on this shirt, which comes in black and navy. This tagless, 100% cotton shirt is printed in Minnesota with eco-friendly, non-toxic inks and is available in women's sizes small to extra-large. Moms who love science — or a good joke — will love this shirt! 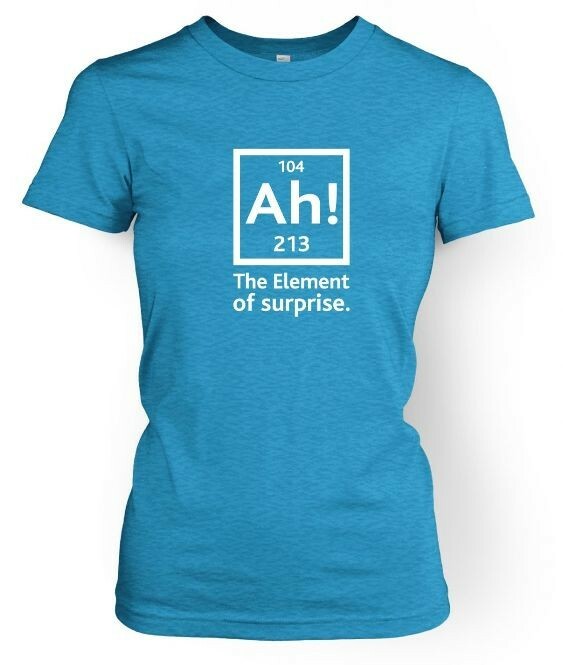 The Element of Surprise (atomic symbol Ah!, naturally) looks great on this 100% cotton shirt, which is available in a wide variety of colors. Go All Out Screenprinting prints all of their shirts in the US, and chooses soft, high-quality cotton fabric that's made to last. This semi-fitted shirt comes in sizes from small to XXL. 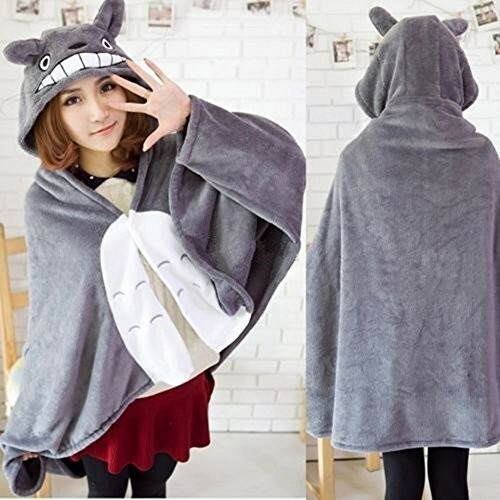 Moms who love My Neighbor Totoro can snuggle up -- or head out on the town -- in this cozy plush cloak based on Totoro himself! This unique cloak is perfect as a shawl for chilly days or as part of a costume or cosplay. For a more subtle tribute to this friendly forest spirit, check out this 3-pack of no-show Totoro socks. 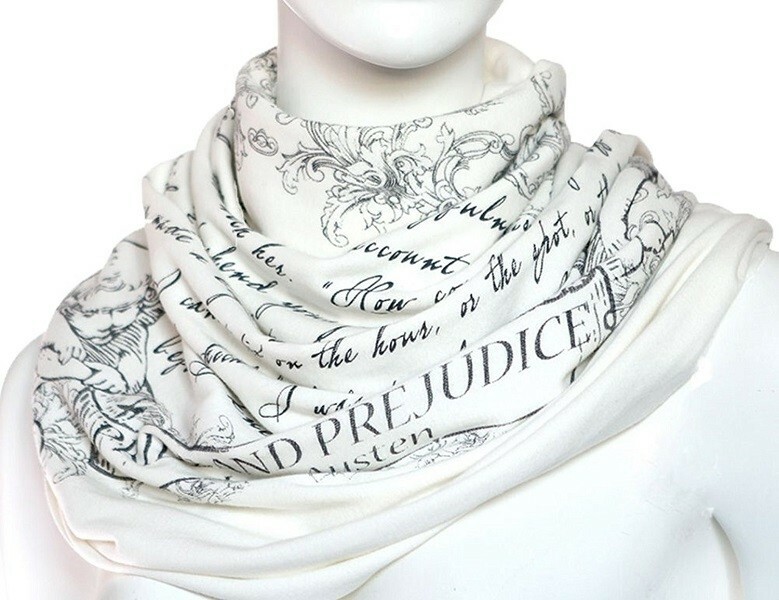 Show off your love of Jane Austen's classic Pride and Prejudice with this beautiful jersey knit scarf from the Literati Club! This 60" scarf comes with a stylish reusable zippered pouch for storage and features a moment from the end of the novel when Elizabeth asks Mr. Darcy when he fell in love with her, to which he answers "I was in the middle before I knew that I had begun." It's the perfect gift idea for a literature lover! When America joined World War II, women discovered that they had the power to keep the country's factories working — no men required! This iconic image reminded the women of 1940s, "We can do it! ", so these socks are the perfect way to give Mom a little encouragement when she needs it. 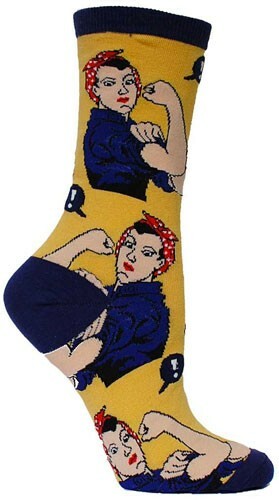 These fun 70% cotton, 27% nylon, 3% Lycra socks feature a graphic of Rosie the Riveter on a yellow background. They're one size, which fits most women's shoe sizes 5 - 10. The same design is also available on a pair of socks with a black background. 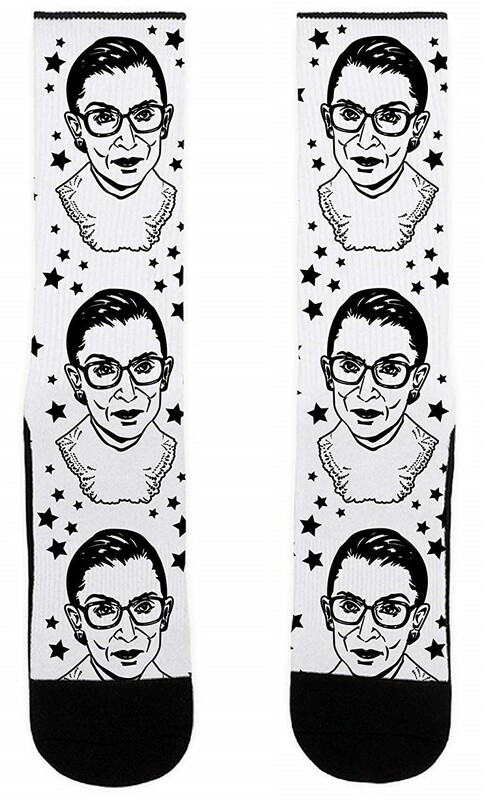 Moms who are champions of literature will love these socks that take on censorship! 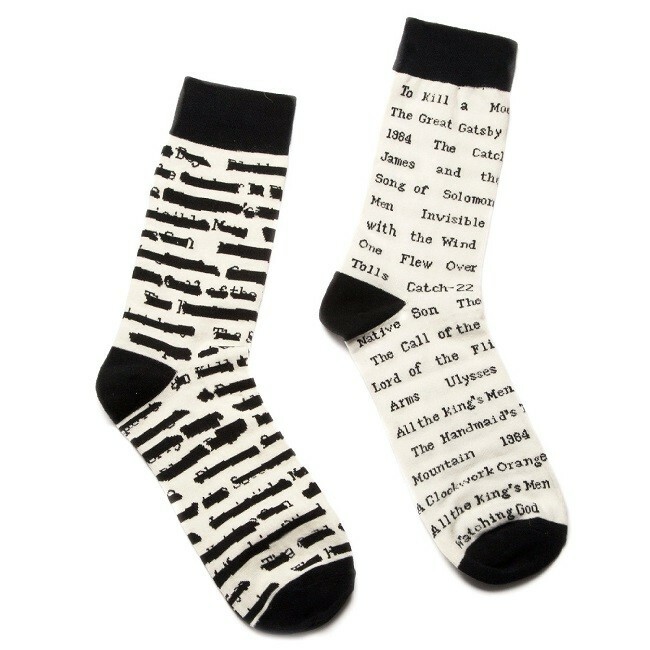 These Banned Books socks by Out of Print feature a print with names of commonly banned and challenged books: on one side the names are legible and on the other they are blocked out. These 75% cotton, 10% nylon, 10% polyester, 5% Spandex socks come in unisex sizes small (fits approximately shoe size 9 - 11) and large (fits approximately size 10 - 13). Plus, Out of Print's partnership with Books for Africa ensures that one book is donated to a needy community for every pair sold. 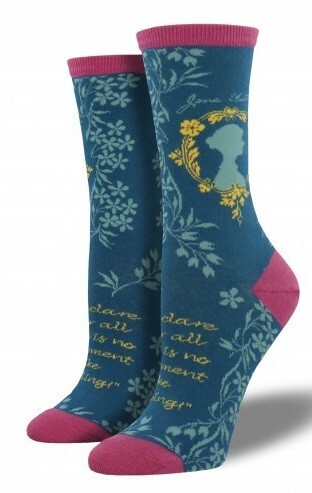 Mom can pay homage to one of the greatest authors of English literature with these colorful and elegant Jane Austen socks from Socksmith! Elegant floral decorations are accompanied by a quote from Pride and Prejudice: "I declare after all there is no enjoyment like reading!" These socks are available on both a lavender and a steel blue background and come in one size that fits most women's shoe sizes 5 to 10. What are you up to today? Oh, just runnin' the world and stuff! If the mom in your life knows how to make sure business gets done, she'll love these fun 50% nylon, 48% combed cotton, 2% spandex socks with a whimsical print from Blue Q. These socks come in one size, which fits most women's shoe sizes 5 - 10. 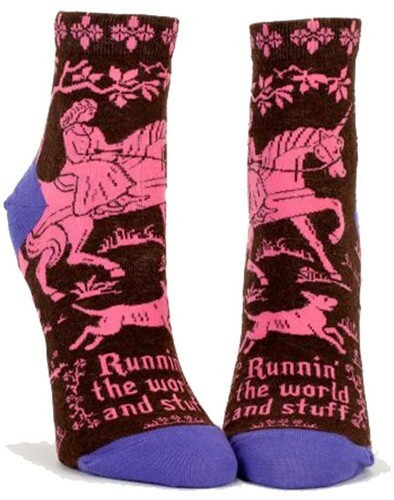 You can also check out this other fun pair of Blue Q socks which celebrate the girls and women who aren't afraid to raise a little hell to get things done. 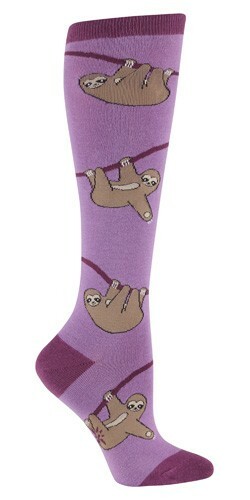 If Mom is feeling a little slow — or just loves unique members of the animal kingdom — she'll love these sloth knee socks depicting several dynamic poses (well, dynamic for a sloth.) Sock It To Me's funky sloth knee socks are comfortable, warm, and made to last. These 75% cotton, 20% polyester, 5% spandex socks are one size fits most women's shoe sizes 5 - 10. 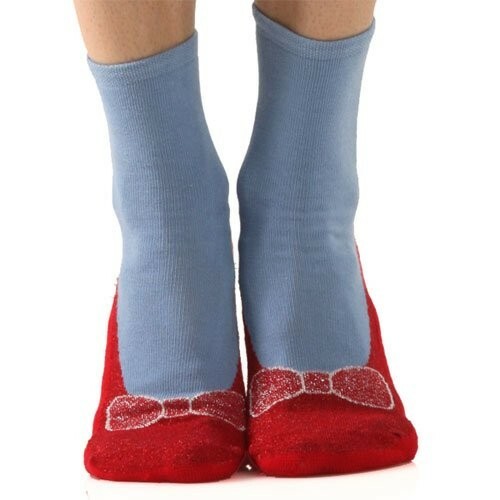 If the mom in your life is a fan of Dorothy from The Wonderful Wizard of Oz, she'll love these colorful ruby slipper socks! These cotton/nylon/spandex blend socks feature a whimsical design with metallic red thread. With cozy fabric and non-slip soles, they're the perfect way for an Oz fan to keep her feet warm. Available in one size, which fits most women's shoe sizes 4 - 10. A special Mom does so much not just for her children, but everyone in her life, so this Mother’s Day, let her know just how much she inspires you with a gift that returns the favor! We wish all the Mighty Moms out there a very happy Mother’s Day. For more ideas for celebrating Mother’s Day, check out our blogs Celebrating Mighty Moms and Their Daughters and Celebrating Mom In Music: Mighty Girl Songs for Mother’s Day. For Mighty Girl books that celebrate the mother-daughter relationship, visit our selection of books about mothers. For parenting books to encourage positive mother-daughter relationships, visit our mother & daughter parenting section. For more books to uplift and support parents, visit our inspirational parenting section.